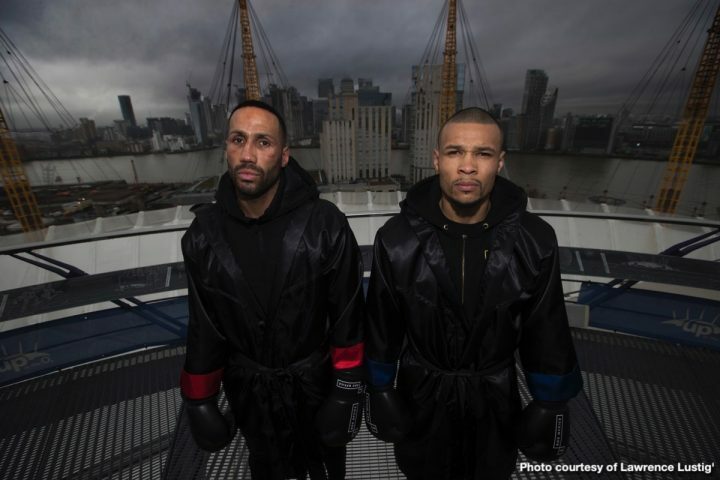 By Tim Royner: Chris Eubank Jr. (27-2, 21 KOs) acknowledges that he cannot afford a loss to James DeGale (25-2-1, 15 KOs) in their fight on February 23 on ITV Box Office at the O2 Arena in London, England. Eubank Jr. lost badly to George Groves a year ago in February 2018 in the final of the World Boxing Super Series 168 lb tournament, and he’s trying to show that he’s improved his game since then. The International Boxing Organization super middleweight title will be on the line for the fight. This isn’t one of the major titles, but that’s all Eubank Jr. and DeGale could get. Neither of them are in position to fight for one of the four big titles at 168. The winner of DeGale-Eubank Jr. fight might get a crack at one of the world champions depending on how good they perform and the amount of PPV buys the match draws. Eubank Jr. won his last fight in beating domestic level fighter JJ McDonagh by a third round stoppage last September, but that was too poor of an opponent to show whether he’d improved his game or not. McDonagh is someone that Eubank Jr. would have beaten with all the old defects in his game still present. It might not mean much even if Eubank Jr. does defeat the 33-year-old DeGale. ‘Chunky’ has looked really bad lately in his two fights against Caleb Truax, and it seems pretty clear that he’s not the same fighter that he once was. At this point in time, beating DeGale isn’t going to prove that Eubank Jr. can mix it with the best of them at super middleweight. Beating DeGale will only show that Eubank Jr. can beat a guy that looks like he’s at the end of his career or at least end of being a major player at 168. DeGale has become kind of another Adrien Broner type of fighter, who is still good at trash talking, but whose boxing skills can’t match his ability to talk up his fights. Eubank Jr. has a new trainer, and he’s supposed to be improving his game. With all the glaring holes Eubank Jr. showed in his game against Groves, it’s not likely that he’s going to be able to go from beating DeGale to defeating the likes of Callum Smith, David Benavidez, Saul Canelo Alvarez or Caleb Plant. Those guys are at a different level than Eubank Jr.
“The only view that’s going to stick in his mind is looking up at me from the canvas after I lay him out,” Eubank Jr. said of DeGale. DeGale vs. Eubank Jr. will be shown on ITV Box Office in the UK. There will be some boxing fans that will be willing to order the fight, but it’s hard to imagine a lot of them wanting to see this fight badly enough to pay to watch it. If DeGale was still in his prime, and holding a world title, and if Eubank Jr. hadn’t been embarrassed just last year in his loss to Groves, then perhaps it would make sense for their fight to be shown on PPV. On the undercard, former IBF featherweight champion Lee Selby (26-2, 9 KOs) will be fighting Omar Douglas (19-2, 12 KOs). Selby lost his IBF 126 lb title last May in a 12 round split decision defeat to Josh Warrington. Selby vs. Douglas figures to take place at super featherweight. Selby has outgrown the featherweight division at age 31. Douglas has won his last two fights since losing to Javier Fortuna and Edner Cherry.